The General Knowledge Exam covers material from Section 1 (Introduction), Section 2 (Driving Safely) and Section 3 (Transporting Cargo Safely) from the CDL Manual. 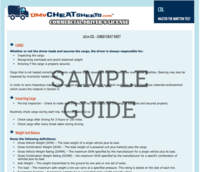 Each state uses the same material for the CDL manual, in accordance with federal regulations and oversight. The General Knowledge Exam must be passed before an applicant can proceed to other written tests, to the pre-inspection test or to the driving skills test. The material included on this review sheet covers key areas that must be understood in order to pass the General Knowledge Exam.